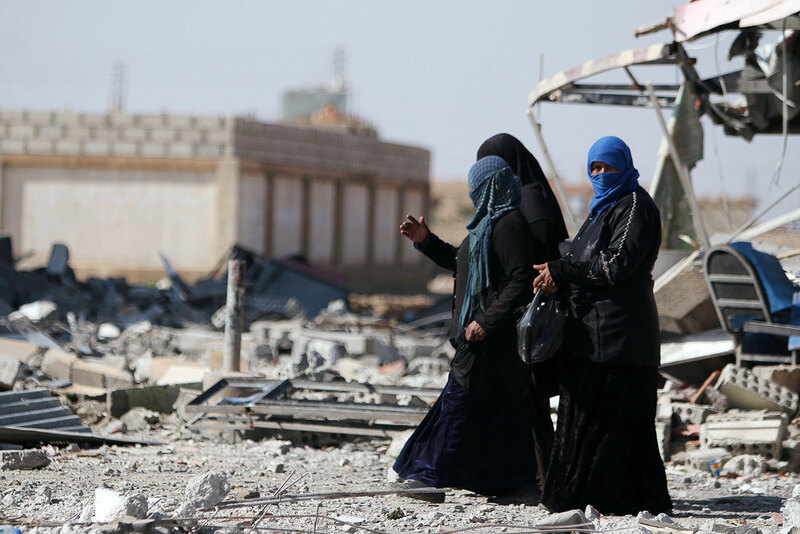 Women walk on rubble in al-Shadadi town, in Hasaka province, Syria. The truce in Syria brokered by Russia and the U.S. appears to be holding, despite reports from some parties of violations. However, the ceasefire does not extend to groups that are recognized by the UN as terrorist. Despite accusations of ceasefire violations coming from different sides in Syria, both Moscow and the West declare that the truce that began on Feb. 27 is holding. NATO Secretary-General Jens Stoltenberg also said on Feb. 29 that the ceasefire in Syria was “largely” being observed. At the same time, he highlighted reports of ceasefire violations and expressed concerns over the Russian military build-up in Syria. As of 00:00 on Feb. 27, the Russian air force has fully stopped carrying out strikes against areas and armed groups that have submitted their ceasefire notifications, said Sergei Rudskoi from the Russian General Staff. However, pointed out Sergei Kuralenko, head of the Russian ceasefire coordination center in Syria, “this does not mean that militants from ISIS and Jabhat al-Nusra can breathe a sigh of relief.” These groups, as well as the other formations listed by the UN as terrorist groups, are not covered by the ceasefire. At the same time, over the weekend, airstrikes against ISIS (Islamic State) targets were delivered by the U.S.-led coalition: 12 in Syria and 12 against ISIS targets in Iraq. Russia has recorded “nine instances of violations of the cessation of hostilities,” according to the Defense Ministry, which claimed the attacks were launched by the so-called moderate opposition. In addition, according to the Russian military, shelling from Turkish territory was recorded. Kuralenko said that Russia had asked the Amman-based U.S. ceasefire coordination center “for clarification as regards shelling of Syrian territory from Turkey,” the latter being a member of the U.S.-led coalition. Relations between Russia and Turkey have been extremely tense since the Turkish air force shot down a Russian Su-24 jet along the Syrian border on Nov. 24. For its part, the Syrian opposition has reported more than 15 ceasefire violations committed by government troops and their allies. The French Foreign Ministry also complained of air strikes against moderate opposition groups and proposed convening a session of the Syria ceasefire task force. The harshest accusations, however, came from Riyadh, with Saudi Foreign Minister Adel Al-Jubeir accusing the Syrian and Russian air forces of breaking the ceasefire. Al-Jubeir said Riyadh was discussing this issue with other countries and threatened that they would resort to a “Plan B” if Syrian President Bashar al-Assad and his allies do not observe the ceasefire. He did not reveal any details of this plan. Incidentally, earlier U.S. Secretary of State John Kerry also threatened to resort to a Plan B if the ceasefire failed – without, however, disclosing any further details. Commenting on accusations of ceasefire violations, Kremlin spokesman Dmitry Peskov urged caution. “Moscow has already called on everybody to exercise extra caution and care when accusing anyone of breaking the ceasefire. The situation remains volatile. One can only repeat this appeal once again,” he said. For its part, the Russian Foreign Ministry insisted that Moscow was strictly complying with the ceasefire agreement and that there was no substance to “anonymous hoaxes” about violations committed by Russia. In a telephone conversation on Feb. 28, the Russian and U.S. foreign ministers discussed the need to prevent any “hoaxes … and provocative reports” alleging ceasefire violations in Syria.